Matter is everything that takes up space and has mass. Everything around you is matter: the air you breathe, the water you drink, the food you eat. They are all matter. But, they are all different kinds of matter. The air you breathe is a gas. It floats all around you. The water you drink is a liquid. It flows smoothly down your throat. The plate that holds your food is a solid. You can hold it in your hands. Solids, liquids, and gases are the different states of matter. Some things can easily change states. If you freeze it, it becomes ice, a solid. If you boil it, it becomes water vapor, a gas. A book is a solid in the shape of a rectangle. A ball is a solid in the shape of a circle. Solids are made of little pieces called particles. They are packed closely together. They can't move across each other, or float away into space. They can be hard like a block or soft like a blanket. They can be heavy like a boulder or light like feather. They can be hot like a pizza or cold like an icicle. Liquids do not have a shape. They take the shape of the container they're in. 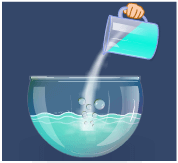 Water can fill a round bowl. It can fill a square pan. Or it can fill a tall glass. Liquids are also made of little pieces called particles. The particles of a liquid are held together loosely. They move and slide across each other. 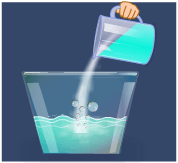 When you pour water, it flows into a container. It's not like a solid. Solids tumble and bang into each other. Liquids are soft, and not hard. They can be hot, like a mug of hot chocolate. They can be cold, like a cold glass of lemonade. Gas particles are not held together. They float away and fill up the space they're in. Gases can be light or heavy. 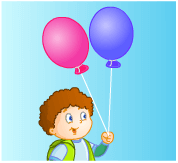 A gas called helium is lighter than air. That's why a helium balloon stays up! Gases can be hot or cold. When you're outside on a winter day, you can feel the cold air. There is another state of matter called plasma. Plasma is a gas that has been heated. It becomes charged with energy. The sun and the stars are made of plasma. Plasma is seen on earth in flames and in lightning. It can also be made and used by people. We use it to light up neon signs. matter that has particles that are not held together. They float away. Gases fill up whatever space they're in. matter that has particles which are held together loosely. They flow and pour. Liquids take the shape of the container they're in. matter that has particles which are held together tightly. They don't move. Solids have their own shape. a gas that has been heated and becomes charged with energy. Matter is all around us. It's everything that takes up space and has mass. There are different states of matter. They are solids, liquids, and gases. Solid particles are held together closely. They have a shape. 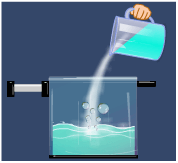 Liquids particles are held together loosely. They don't have a shape. Gases are not held together. They float away. Matter can change states. Water can change to a solid (ice). It can change to a gas (water vapor). 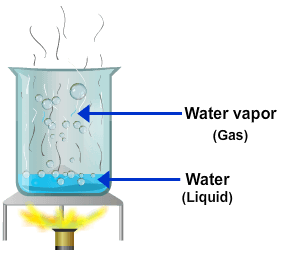 Plasma is a gas that has been heated and becomes charged with energy. *Ask an adult to do these with you. A. 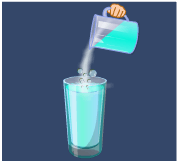 In your kitchen and/or bathroom, find 3 solids, 3 liquids, and 3 gases. B. Identify parts of your body as solids, liquids, and gases. What shape is it? Does it have several shapes? What color is it? Is there more than one color? What makes it different from a liquid? How is it different from a gas? D. Experiment with a liquid! Pour water into a glass to watch it behave as a liquid. Pour it into different shaped containers and see if it takes those shapes. Can you hold water in your hand? What else can you do with it? Boil water and watch it turn into water vapor. How long does it take to boil? 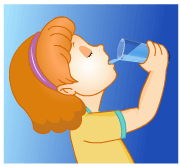 Put water into a container and place it in the refrigerator to see it freeze. How long does it take to freeze? Leave an ice cube out in a bowl. How long does it take to melt? E. Experiment with a gas! Pour the Pop Rocks into the balloon. Using a small funnel will help. Carefully-without spilling the candy out-put the opening of the balloon over the opening of the soda bottle. Lift the top of the balloon up and shake gently so that the candy falls into the bottle. The soda has a gas in it (carbon dioxide). The candy contains the same gas! The gases combine and start to escape. Since gas likes to move around and fill up spaces, it goes up into the balloon and inflates it. F. Play the "solid, liquid, and gas" game. (Requires 3 or more people). When the leader calls out "solid," all get close together. When the leader calls out liquid, all separate to "handshake" distance, and briefly take and drop each other's hands. When the leader calls out "gas," all move randomly away from each other. The leader gets faster to see if the players can keep up! 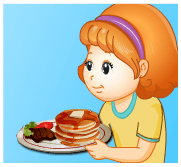 A bouncy game for Grade 1 kids to strengthen their.. 85,443 Plays Grade 1	(1304) What's the Matter? A bouncy game for Grade 2 kids to strengthen their.. 48,427 Plays Grade 2	(897) What's the Matter?